Recently I saw some of my Facebook friends start spreading a rather weird method to check and see the top 10 Facebook friends who viewed or stalk your Facebook profile. Below are the 2 examples of the method share through out the Facebook. I’m very sure it is a hoax when I first know of it. So what are those ID use in Facebook? Those are the the Facebook users / friends which will appear in your top Facebook chat list especially those who recently chat with your or send you any Facebook message. It is nothing special. Even if you don’t enable Facebook chat, those ID will be there too. As of today, I never heard of any method where you can actually track who viewed or stalked your Facebook profile. 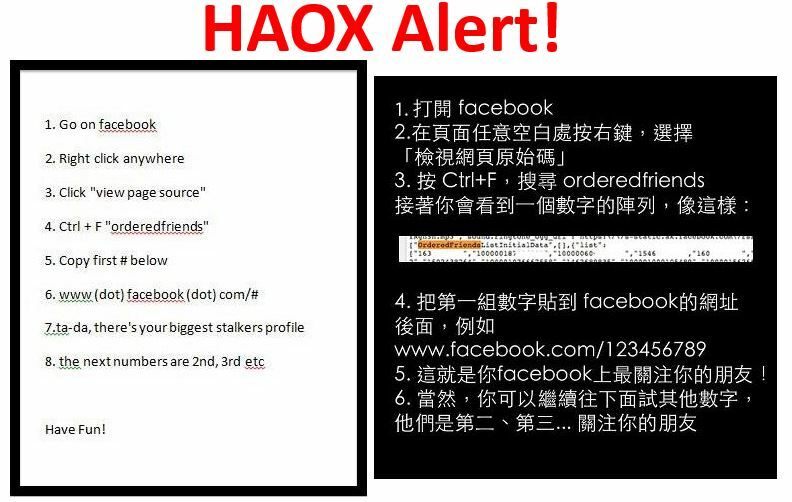 So don’t caught by those silly hoax that are try to attract your attention by telling you how to track your friends. None of them work! Recently on first of April, MouseHunt Autobot 1.17 is not working on MouseHunt game in Facebook anymore. I’m working hard to fix the trouble. While waiting, you all can still run the same script on http://www.mousehuntgame.com/ using your Facebook account. [Update] The script had been fixed. Check out here. This is not an April’s Fool.